The permitting process in Torrance Co requires submission and approval to the county seat and upon that approval, submission of documents to the state. 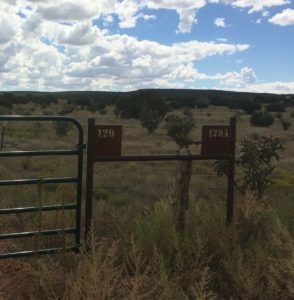 Being a rural site, parcels are not issued an address until a building permit is requested. Up to that point, the only way to locate our property was (county road) B074 at the intersection of (county road) B077. 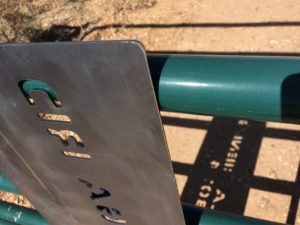 Separately, in the summer of 2015, we had our unused corten “129” and “129a” building number signs from Calyer Street in Brooklyn welded to our Torrance Co. property fence line adjacent to the property gate. A little bit of Calyer in the New Mexico high desert, I suppose. Upon issuance of our county permit, we were assigned the address “91 La Cienega Rd (B074)”. But since we already had “129” and “129a”, we couldn’t just add a “91” to the mix without causing visual chaos. 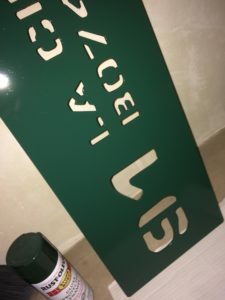 So, we had a metal sign fabricated by a US Military vet in Montana, that spelled out the entire address “91 La Cienega Rd, B074”, painted it green and will have it welded to the green gate, hopefully differentiating clearly between our former, Brooklyn addresses and our current Torrance County address. 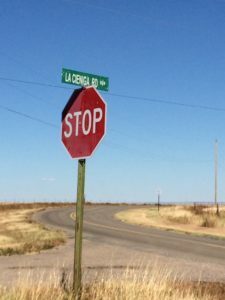 …and just to further confuse the issue, the road sign seems to have misspelled the street name. We used the spelling on the permit approval forms and the county assessor’s office web site.